When Grandpa and Grandma Major’s first child was born in 1931 they named her Barbara June—Barbara because they liked the sound of it, June because she came into the world on June 3rd. The baby had dark hair and eyes, and her destiny stretched out before her like blank pages waiting for her to fill them with her story. Like all newborns, she had no idea or inkling what life would hold for her. She was loved and wanted, surrounded by an abundance of generational guidance. She joined a large extended family that lived close-by one another on and around Elm Street in Port Colborne, a bluecollar town on the northeast shore of Lake Erie at the mouth of the Welland Canal. It was the hardscrabble Great Depression, and her family, like their friends and neighbors, scraped to make ends meet. There was a communal aspect to living, which meant caring and compassion was nurtured in her. People shared with each other, and there was no shame involved because it was easy to see that everyone was in the economic quagmire together. 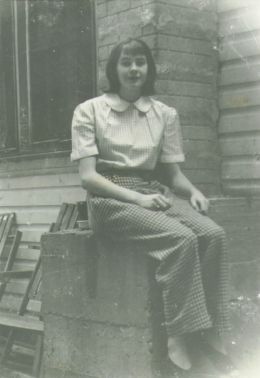 Barbara June learned early on that life involved constant work. There were gardens to be planted, weeded, cultivated or harvested. In backyard coops, there were eggs to be gathered and chickens to be fed. The kitchen was the place where meals were prepared, and in the midst of good-natured gossip, where life-lessons were taught. Principles about conservation and storing up for days ahead were ingrained in Barbara June as whatever bounty the gardens produced was systematically canned and preserved. Since cash was a rare commodity, the age-old barter system functioned just fine in those days. 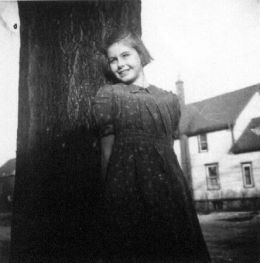 The little girl named Barbara June got immersed in the intrigues of it, and by the time I got to know her, she qualified as an exceptional expert in the art. I highly doubt that my mother ever paid the sticker price for anything. We were on a Sunday afternoon drive along a dusty road in a big, old red beast of a Buick. It was the late nineteen fifties, and from my perspective life was just one escapade of fun followed by another. What transpired on this particular day was told to me much later, often by my mother, with a gleam of sadness in her eyes. My older sisters Jane Ann and Janice were with me in the back seat. We were excited and chattering about the treat awaiting us. Sunday afternoon drives meant a mid-way stop for ice cream cones. Mom asked us a question. My sisters both answered, but I was slow to respond. Mom repeated it for me. I sort of heard her. “Turn around, Mom, I can’t hear you,” I said, which evidently startled her because she swiveled around to stare at me. Then a strange expression clouded her face, a wrinkling up of her brow that I would come to know as her worried look. That simple sentence, Turn around, Mom, I can’t hear you, set off an urgent discussion between my parents that went on for a long while. My sisters poked at me, then distanced themselves as though I was in trouble. Over the next couple days, Mom and Dad took turns talking to me. First with faces almost pressed up against mine, then they’d make me turn away from them. I surely thought it was some kind of game. 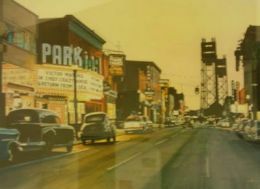 Shortly after the incident in the car, arrangements were made and I was taken to a special doctor whose office was on Division Street in Welland, which was a big city—or at least that’s what I was told. It was only ten miles or so from our driveway, but back then, that was an almost epic journey. My parents downplayed it, but I figured something strange was going on because it was the middle of the week and my father was home from work. 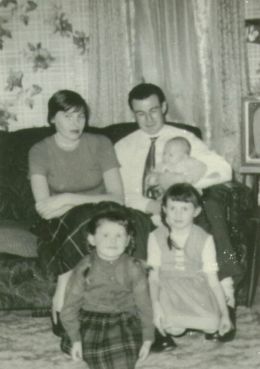 Adding to the strangeness was the fact that Dad and Mom were dressed up in their good clothes. Of course, I was outfitted like a little gentleman, with gobs of greasy stuff slicking my unruly hair down. The doctor took us into a room where he proceeded to examine my eyes, ears, nose, and throat. He did all sorts of things, none of which hurt, but were kind of funny. The silver instruments were cold, and I wiggled more than once, which got an eyeballed admonishment from my mother. When the doctor spoke to me he got in my face and said words slowly, always saying my name. I’d nod or shrug. He gave me clear instructions, and then put headphones on me. They were warm and smelled a bit yucky. I listened to a series of beeps, pushing a button to signify whether I heard them in my left ear, right ear or both ears. Sometimes I wouldn’t hear anything, which caused him to double check dials and settings, and then make notes on his pad. My parents watched every move the doctor made, their faces frozen in forced smiles. With all the probing, prodding, and testing over, we were taken into an office. The doctor spoke to them, occasionally glancing at me. The gist of his diagnosis was that I had tone deafness—there were peaks and valleys on the sound spectrum that didn’t register in my brain. I had naturally adapted to it by developing an ability to read lips to fill in those word sounds I didn’t really hear. It explained something that had been bothering my parents. I was four years old and though I talked all the time, evidently not very clearly. Outside of my family, few could understand me. I guess I said words the way I heard them, which must have sometimes been muffled. None of what the doctor told Mom and Dad that day had any meaning to me. Nor was it ever presented as a problem or anything outside the realm of normal, though all of a sudden I was doing daily talking lessons, what today would likely be referred to as speech therapy. The doctor had given my parents a stack of papers. Mom was the one who took charge of my re-learning how to talk. I had to form my mouth this or that way; my tongue could no longer operate without conscious thought—it had to be reprogrammed. Every single day, and sometimes two or three times a day, she would put me through the paces of repeating the same vowels or sounds over and over again until I got them exactly right. “Enunciate, Kenny,” she’d demand, patiently or impatiently depending on my effort. The phrase got tattooed on my brain. I can still hear her saying it. By the time I started first grade, my speaking was greatly improved, but still not quite right. For that reason I was the only one in my class to not get a speaking gig in the Christmas Concert—I had the important job of playing the triangle, striking it loudly at crucial moments. 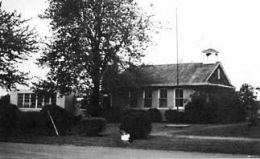 Carl McNeil School, a three-room schoolhouse at the corner of Quarry Road and Highway #3, was the site of my debut as a world-class triangle player. It was also there, a few years later, that an enjoyment of social studies was lit up in me that’s never been extinguished. One winter day in grade four I came home with a special flier that contained news which would have a dramatic effect on me. 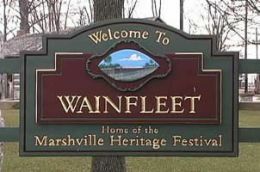 Wainfleet Township was sponsoring a public speaking contest. All the schools of the township were to be involved. The announcement didn’t seem like a big deal to me, but my mother saw it differently. To her it was an opportunity to continue training my tongue to wrap itself around the proper pronunciation of words. My chosen subject was the Royal Canadian Mounted Police (RCMP). I started with the World Book Encyclopedia on our kitchen table, and then spent a Saturday morning at the Port Colborne Library, and checked out a pile of books on the topic. I wrote a fine essay, jammed with facts. The first draft got marked up real bad by Mom. More than one word had a big X through it, along with several complete sentences eliminated by dark lines. There were circles and arrows to move passages around. Mom explained the meaning or reason for every notation, all the while asking if I understood. She was the kindest editor I’ve ever worked with, and likely the only one who truly cared for what I had to say. Several rewrites later Mom declared it finished. I was pleased to be done, but not so fast, mister. Now there was memorizing, followed by hours and hours and hours standing up straight in front of her delivering the speech, with her constant barrage of instructions. “Enunciate, Kenny. Speak clearly. Don’t slouch.” Mom told me where in the script to pause and how long to pause—where to raise my voice and where to lower it. The contest started in our classroom. A manuscript had to be handed in to the judges, but 3 x 5 cards could be used by each contestant. Mom’s rules were a bit stricter; there’d be no 3 x 5 cards for me—my speech was inside my head. Over the course of several weeks, the competition had preliminary stages, which I breezed through and kept advancing. 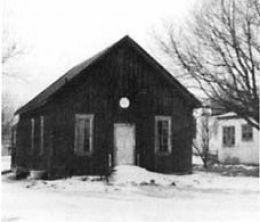 The finals were scheduled on an evening in the old P.I. Hall on Burnaby Road. It was packed wall to wall and there was anticipation in the air. I was dressed in a suit and tie, and had practiced to the point of mind numbness. I could regurgitate the words without even considering them. That night is a blur. I’ve long forgotten how many students I competed against. What I do recall is the pride expressed by my parents, especially Mom. I didn’t win—I got an Honorable Mention, which according to my mother was better than excellent. It took a couple days for it to sink into me what Honorable Mention really meant. When it did, I wasn’t at all impressed. I wondered why Mom was so exuberant in her praise. The reason came to me many years later from a between the lines conversation with her. The whole public speaking exercise was the culmination of my talking lessons. To Mom’s way of thinking, the fact that I’d done so well proved that I’d overcome the speech impediment caused by my tone deafness. Mom always told me that I was special. There was only one of me in the whole wide world. Handy information to file away for those times when life takes unexplained and unfair twists. Due to a freak accident at second base, a good chunk of my adolescence was marred by pain. I spent six months in the hospital, and a much longer time dealing with the consequences of not settling for a single in a baseball game that was meaningless. The hospital confinement had a profound effect on me, isolating me and driving me deep down into an introspective maze. Mom refused to hear a negative word or any kind of defeatist attitude from me. She made me know that everything in life happened for a reason. 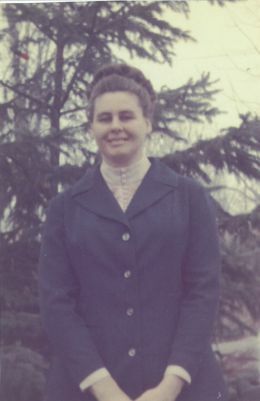 Mom was a tenderhearted woman with a backbone of steel. She placed expectations on me that were sometimes overwhelming. She saw stuff in me that I still haven’t found. Excellence was the only acceptable outcome for any aspiration. Mom told me that my reach would always exceed my grasp—to dream and chase dreams was to be done regardless of brick walls and dead ends. My mother’s contribution to my outlook is on full display every time I sit down to write—each word must be the exactly perfect choice. There’s no such thing as just good enough—there is only satisfaction in a well-crafted sentence or story. Like many of us, what my mother could do for me and others, she often could not do for herself—I’m intimately acquainted with that dynamic in my life. Yet wisdom gathered in experience is to be passed along because it’s a long road that has many turns, which is one more truth my mother told me—a truth she’d gleaned from her mother.